count_to_10 wrote: Am I seeing that right, or is there some kind of optical illusion tricking my eyes? Well, no wonder. Besides the mixture of 2D and 3D objects there, it looks like one of the bay doors is just flat out missing. count_to_10 wrote: Well, no wonder. Besides the mixture of 2D and 3D objects there, it looks like one of the bay doors is just flat out missing. Yep. Outer bay door is omitted, while the flipper door is rendered in 2D. Lockheed Martin Corp., Lockheed Martin Aeronautics Co., Fort Worth, Texas, is being awarded a $34,622,661 cost-plus-fixed-fee contract for weapons capabilities technology maturation and risk reduction pre-engineering, manufacturing and development activities for dual-capability F-35 Lightning II joint strike fighter aircraft and small-diameter bomb 2 (SDB-II) in support of the Marine Corps and Air Force. Work will be performed in Fort Worth, Texas, and is expected to be completed in July 2018. Fiscal 2017 research, development, test and evaluation ( Marine Corps and Air Force) funds in the amount of $6,000,000 are being obligated at the time of award, all of which will expire at the end of the current fiscal year. This contract was not competitively procured pursuant to Federal Acquisition Regulation 6.302-1. The Naval Air Systems Command, Patuxent River, Maryland, is the contracting activity (N00019-18-C-1004). ....that Marine Corps "thingee", would that include both the "Bee" and "Sea"...me thinks, we'll see! "Raytheon comes to Farnborough hunting for new export orders for the StormBreaker bomb, but the timing of deliveries will depend on pending decisions by the US government on weapons integration upgrades for the Lockheed Martin F-35 fighter. The F-35 programme is still reshuffling a package of upgrades planned for the continuous capability, development and demonstration (C2D2) phase, which was formerly known as Block 4 follow-on modernisation. Integrating the StormBreaker — GBU-53/B small diameter bomb II — is still included in the C2D2 integration, but the “dust hasn’t settled yet on exactly” when, Raytheon officials say. ...The 93kg (204lb) weapon is designed with the unique ability to hit a moving target in any weather. In clear weather, the StormBreaker can use an infrared camera or semi-active laser to continuing tracking a moving target. If the path to the target is obscured by weather, smoke or dust, the weapon can switch to a millimetre wave radar. All three sensors share a common radome, one of the most advanced components on the weapon...."
What's next ? Thanos ? NO Née. Not often does one see Née in an aviation story let alone da weapons one. For Fsake - ROFL. ...Née Small Diameter Bomb II (SDB II), StormBreaker, with its tri-mode seeker, is getting a step closer to providing USAF pilots a capability to strike maneuvering targets. Cristy Stagg, program director, told AIN that, because of one of its competitors, it recently changed the name of the weapon to StormBreaker…. ...threshold platform, from international viewpoint the key could be the F-35A aircraft, he added." ...the F-35 is not expected to carry it until roughly 2022, officials said. The Air Force, which classifies the bomb as the GBU-53, is the lead service on the program. "We're working as hard as we can to pull that [fielding] to the left," Meger said. ...An F-35 can carry 24 total StormBreaker bombs, eight internally and 16 externally. The bombs were previously known as small diameter bomb, or SDB, IIs. "Imagine....they have to defend against swarming boats. You can start sending a whole bunch of the SDB IIs out to go find those boats as you're providing information to them, data linking to them," he said. The StormBreaker's predecessor, Boeing-made GBU-39 SDB I, uses similar precision-guided technology, but lacks the advanced moving-target seeking equipment. 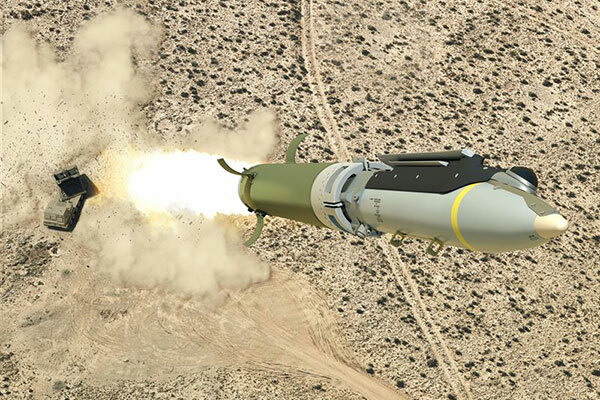 The GBU-39 is used as a low collateral-damage weapon, often in urban environments. With StormBreaker, "you can tell it, 'I'm looking for a tracked vehicle.' And it will classify the different targets for you ... and goes, 'That's what you're looking for,'' Merger said. "That's a huge quantum capability leap." I want to see one fitted with a booster and launched out of a VLS. Given that there is already a Ground Launched SDB1 (on top of an MLRS rocket), SDB2 should be a no-brainer. count_to_10 wrote: I want to see one fitted with a booster and launched out of a VLS. I wonder how the circumference compares to ESSM, since having four of them per VLS tube would be a lot more reasonable tradeoff in space for capability. Far more expensive than the Hellfires they are scotch-taping onto LCS for anti-swarm boat but it would have long range precision strike capability as well, imagine spec ops contacting the destroyer over the horizon offshore to have an urban bunker taken out with low risk of collateral damage. ESSM is apparently 10” in diameter, the SDB is nominally 7”. So, probably. Hmmm. The diameter of the cylindrical body is supposed to be 7”, so maybe the folded wing assembly adds the other 2.5”.